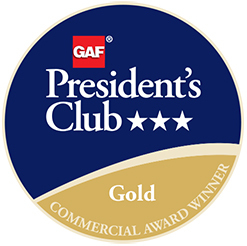 Tecta America Sacramento of Rancho Cordova, California, has received the most prestigious contractor award GAF offers: The GAF President’s Club Award. This highly coveted award recognizes Tecta America Sacramento as one of the “elite of the elite” commercial roofing contractors in the United States. Performance pathway – where contractors focus on giving their property owners the best possible service, quality, and protection. Reliability pathway – where the contractor has a long history of offering their customers the best quality and protection. To become a Master Select Contractor – a status that less than 1% of roofing contractors nationwide are able to achieve – a candidate must demonstrate proper licensing, maintain insurance (in states that require it), have a proven reputation, and show commitment to ongoing professional training. In 2010, this respected northern California roofing contractor rebranded as Tecta America Sacramento to better reflect its structure and to signify its continuing commitment to providing exceptional value through innovative solutions. Backed by the financial strength and depth of resources of its parent, Tecta America, the company still retains its local management team and the same commitment to serving the needs of its customers in Sacramento and the surrounding area. The company’s core strengths are low-slope and metal roofing systems, as well as environmental solutions such as green roofs, solar, and daylighting installations. Tecta America Sacramento is skilled with the installation and servicing of single-ply membranes, coating and waterproofing, green roof gardens, standing seam metal systems, metal, and composite metal panels, architectural sheet metal, skylight replacements, and rooftop safety equipment. In addition to new construction, reroofs, and restorations, the company offers maintenance and repair programs as well as 24/7 emergency services. Tecta America Sacramento is certified by every major manufacturer. Active in the industry, the company is a member of the National Roofing Contractors Association (NRCA), the Building Owners & Managers Association of Sacramento and the Central Valley (BOMA), the Association of Commerical Real Estate (ACRE), Network Sacramento, International Facility Management Association (IFMA), Association of Facility Engineers (AFE), the San Joaquin Partnership, and the Great Stockton Chamber of Commerce. With access to the latest in roof technology and a reputation for quality workmanship, Tecta America Sacramento can install any kind of roof system. The company offers the most comprehensive range of services in the industry: leak repairs, roof replacement, coatings, restorations, new construction, environmental services, and more. More than 25% of all roofing dollars are spent on unplanned repairs, so the smart way for customers to protect their investments is to “leave it to the experts.” Tecta America Sacramento’s experience, knowledge, and capabilities are unsurpassed in the industry.